An unusual shrub like species, Allamanda neriifolia is commonly called the Bush Allamanda. Also known as Allamanda schottii. 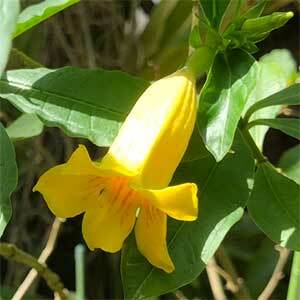 Grown for the attractive golden yellow flowers that appear from spring through summer, this is a plant from Brazil. The foliage itself is glossy and attractive, however the plant, although bush like is a little scrambling in habit. This is a very easy care plant in sub tropical to tropical climates. It can be grown along fences where it will tend to climb a little. Plant in a warm sheltered position. Fertiliser regularly with a liquid fertiliser. This is a plant that will grow well in a container if required. Prune back as required, ensure that you wear protective clothing, gloves and glasses as the plant can be a skin irritants. It is also poisonous if eaten. Easy from seed sown in spring, also possible from cuttings. Common Name – Bush Allamanda, Dogbane. Height – Can reach 2 metres. Spread – This a bushy scrambling plant to around 1 – 2 metres.. Flowers – Tubular Yellow with orange markings. This plant is not widely offered for sale.